At RMI, we believe strongly in taking the time to strategize or plan and organize your moves with an eye on your end game – before jumping into the fray. We support the constant use of objectives before commitment to action or applications of resources. Chances are your time, energy, funds and human capital are limited and precious. Even if your strategy is captured on a cocktail napkin, it’s likely better than the one in your CEO’s head that has never really been articulated. Similar to ski or car racing, it’s sometime prudent to slow down to speed up! Strategic planning is simply a process undertaken to guide an organization toward the achievement of specific objectives and aspirations. Ideally, it involves a broad perspective encompassing the organization, as well as the wider view of the industry, competitors, past performance and both objective and subjective insights. There are many good models. 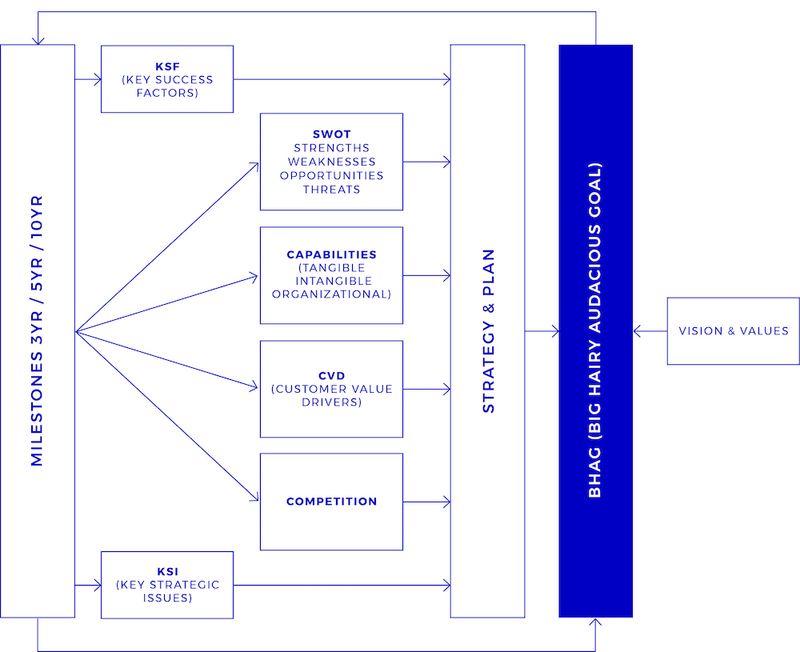 We often use our RMI strategic planning framework to ground our approach. Where warranted, we weave in additional models or elements to tailor the methodology and process to fit your needs and resources. “Strategic planning” is interpreted differently across organizations. Ultimately, we work with you to deliver upon your expectations and outcomes. We often embark on Customer Insights work to inform the strategic direction and focus areas. This typically entails 1on1 phone interviews or for large numbers, online surveys. Prior to facilitated sessions, participants are also interviewed and tasked with pre-work. Most often, RMI is the keeper of the process while the client is the subject-matter expert. Vision & Values or the “Envisioned Future” grounds and shapes the strategy. As in Alice in Wonderland, if you don’t know where you are going, any road will take you there. Begin the journey with the articulation of “success”.